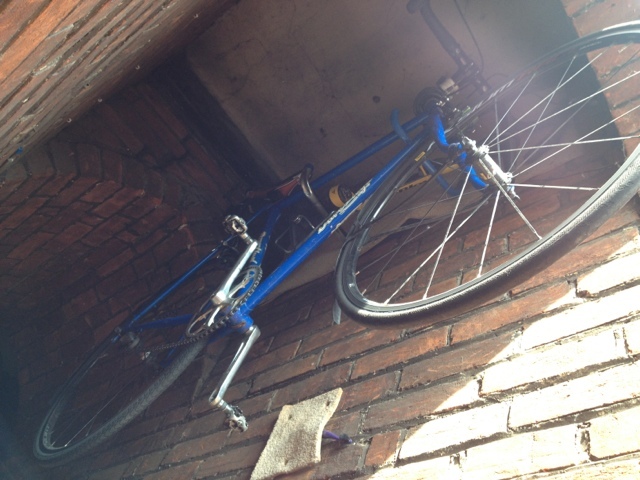 A few friends have asked me how I hang my bicycles to store them. 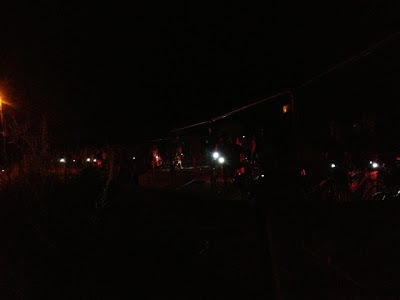 My bikes hang in the passageway between my house and the neighbour's house, so they're secure (we have a lockable gate) and they're out of the weather. One of the bikes hangs on a purpose built bicycle hanger which cost about £12 and the other hangs on two ladder storage hooks bought from a DIY store for about £4 each. 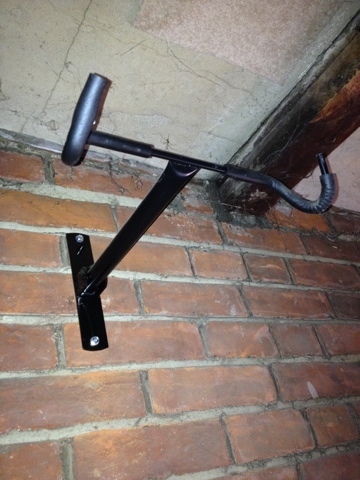 In my opinion it's worth spending a few quid more and getting the purpose build hanger, that being said the ladder hooks provide a useful place to store my track pump. 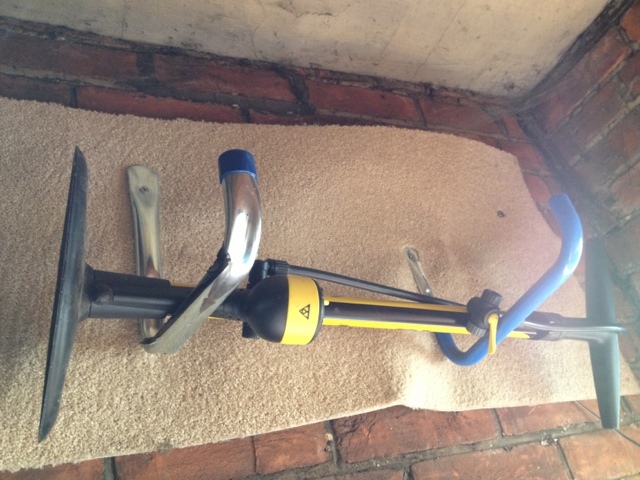 My 'good' road bike gets the luxury of being on the purpose-built bike hanger. 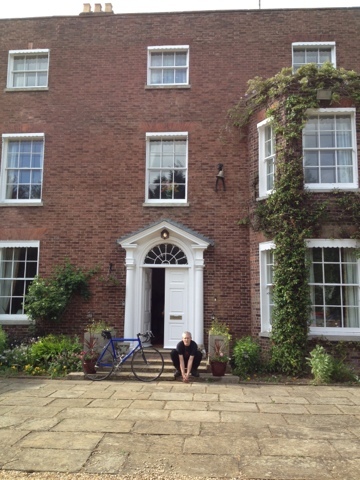 The bike in the background belongs to singer-songwriter Tom Sanderson (a.k.a my mate Tom, a.k.a my neighbour Tom). 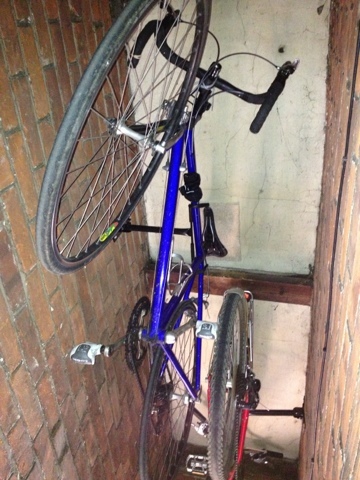 My singlespeed bike hangs on a couple of ladder hooks. The carpet is fixed to the wall to stop the pedals damaging the bricks - because the hooks don't hold the bike in a specific position (like the purpose-built hanger) the bike has a tendency to wang around a bit (technically speaking). I have put a bit of gaffa tape on the left-hand hook to provide the bike frame a bit of extra protection. 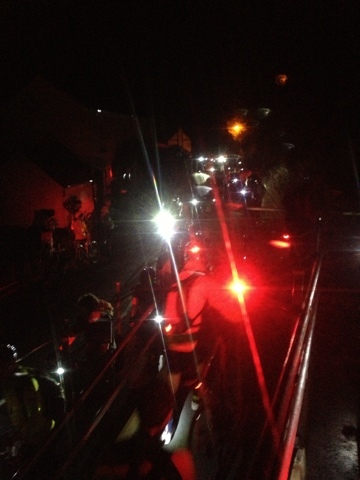 This was my first Dunwich Dynamo and it won't be my last. From the very start I was amazed at the sheer volume of bikes on the road, big bikes, little bikes, tandems, recumbents and a fleet of postmen on their Royal Mail bikes (incidentally they were the only riders with road support!). On the train to London a friend and I discussed our approach to the ride, and we both decided this was a leisure ride and should be time off from any of our silly cycling ambitions. 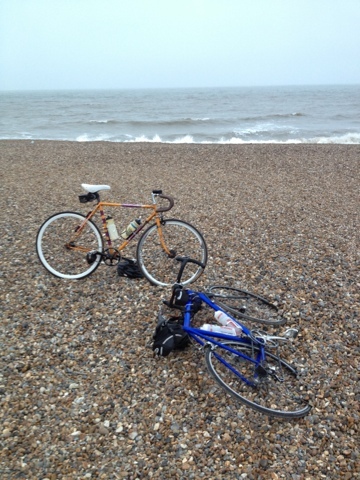 So quite why we spent the first two thirds of the ride hacking into the headwind as fast as possible I'm not sure. My fitness has suffered due to injury recently and I think when I found that I could keep up with the remarkable pace my friends were keeping I was happy to just as reassurance that I've not lost all my hard-earned ability. Two years ago I was a proper fat knacker, and now I was able to keep pace with chaps who were mostly many years my senior. By Sudbury the clicking, grinding, slipping and generally crunchy nature of the drivechain my poor old bike was really getting me down. I'm not normally so bothered by mechanicals but I think the early heady pace was starting to take its toll. My thighs locking up with cramp didn't help either. But when a bike club (who will remain nameless) yelled to us 'SLOW RIDERS - STAY ON THE LEFT' and we rinsed them then raised their pace by 5mph. The ability to muck around with the 'serious' riders made the later struggles well worth it. Did I mention that the rest of my gang (bar me) were on fixies and singlespeed bikes? The general good feeling of the ride totally carried me to the beach; I was really looking forward to a swim but by lummy it was COLD on that beach! The fry up was brilliant and the queues short (at least they were when we rolled in at 5am). I owe a huge debt of gratitude to my mate Sean whose genial good spirits were a huge help when I hit that dark moment when you just don't feel like going on. I've already decided that next year I'll be going a lot slower from the start. Honest. Here's my bike, ready to roll. At least three people during the ride told me that it's a Ribble Audax frame. 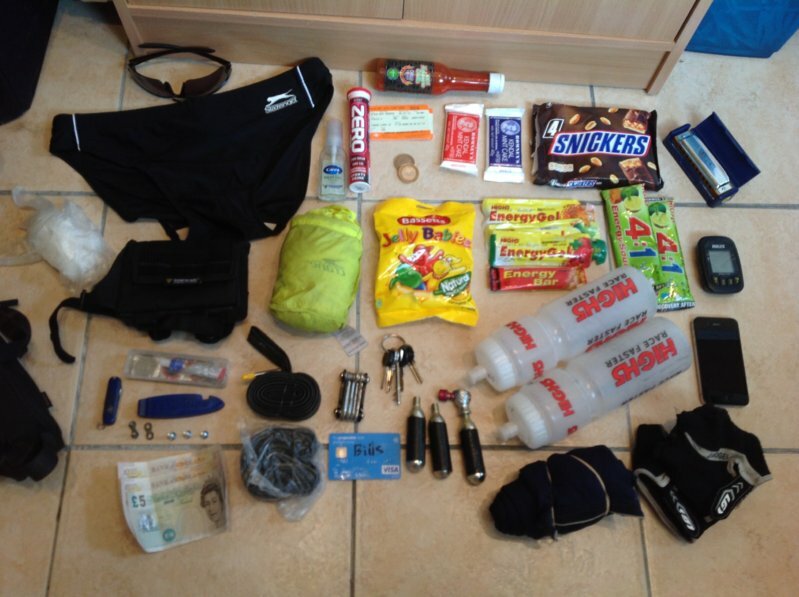 Because this ride is unsupported and there are no feed stations I tool quite a lot of kit with me. 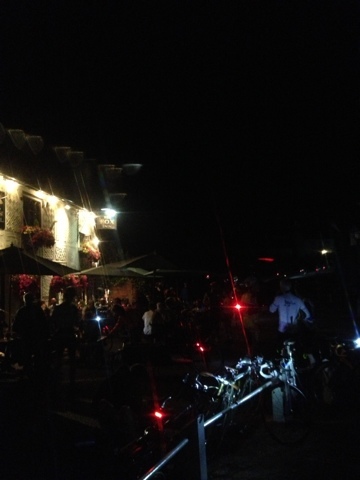 The first pub stop was surprisingly close! We rolled past. At some point we all came up against a road closure, this caused a cheery bottleneck as everyone had to push their bikes up a temporary ramp and through a field. 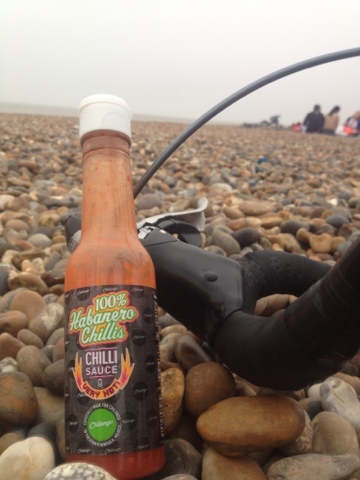 One of the many essential items I rode with; Habenero hot sauce, which tasted GOOD on a fried breakfast! Up front I'll be honest with you - I've not ridden the Dunwich Dynamo before so some of this is guess work and based on many conversations with folk who have ridden the 'Dun Run' many times before. I have ridden many long rides though, so it's not like I'm totally pulling this information out of my bum. My packing list for the Dun Run. I'll be shoving all this stuff in my nice Adnams cycling jersey, in a wee crossbar storage do-whit that I have and in a saddle pack but a few friends will be using rucksacks, which will be fine. 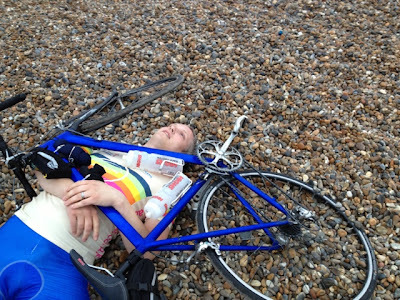 I did a 100+ mile ride with a rucksack a couple of years ago and I was fine. As with any advice I ever give you need to remember that I am by no means any sort of authoritative source for any good information ever. I carry most of this crap around with me anywhere I go on a bike, so it may seem excessive, in fact last time I did an audit of my saddle pack I was surprised how much was in there. I'll be leaving London wearing bibshorts and a cycle jersey, so these are additional items that I'll be carrying either 'just in case' or for when the temperature drops at night. I'll be eating as much pasta as I can stomach for the two days before the ride and I'll also be taking a big pot of pesto pasta on on the train to eat just before arriving in London. I hate riding with too much food in my belly so tend to consume more gels than other folk. That's it! If you're going on the ride then pop over HERE and say hullo! 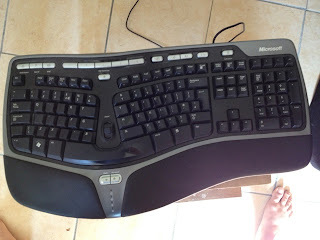 Since 'going Mac' I have no use for this MS Natural keyboard. If you've used one of these keyboards before you'll know that they really are the Rolls Royce of human interfaces. A few of the letters are missing, which sadly is common with all natural keyboards, but if you've used a natural keyboard you'll be aware that this really doesn't matter. I used this keyboard for about two years and am obsessively clean when working at a computer. If you haven't used an MS Natural keyboard then I can summarise by saying that this keyboard might look weird but you'll get used to it really quickly and the massive upside is that you'll hugely increase your typing speed and mitigate any risk of RSI. These keyboards retail at around £50 new, but £20 and this is yours, I'll pay the postage. UPDATE - this has now sold. I am very proud to announce that my wonderful wife now has a website for the gardening business that she has been running here in Suffolk for the past few years. She was lucky enough to serve her apprenticeship at a glorious Suffolk stately home and has since spent her time maintaining everything from huge formal gardens to cute little cottage gardens. I'll say no more for fear of making her blush, instead I'll recommend that you head on over to www.gardencaretakers.co.uk and take a look for yourself. 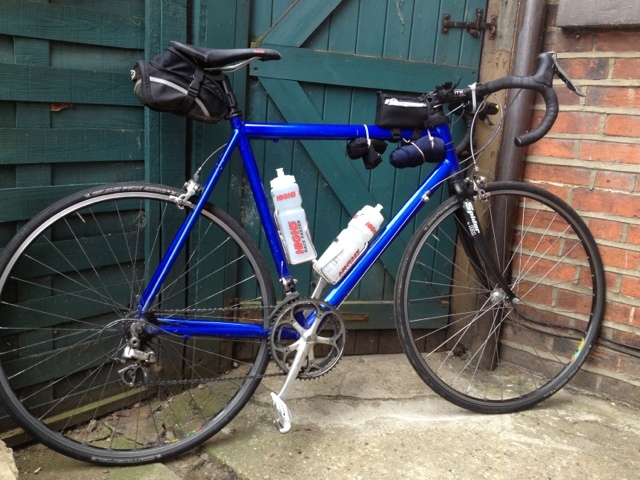 A lot has changed over the last year of bum-in-saddle cycling - I've got my first proper road bike (my old Dura Ace equipped Mr Blue Bike), built (with help) a couple of singlespeed bikes and lost quite a lot or weight. Cycling to work every day has also made me reasonably fast, at least by Strava standards (35 KOMs at one point!) but most of all I feel fitter and healthier than I have in my whole life. The last few months haven't gone quite so well though. I managed to beat my previous average speed over 100 miles but foolishly didn't warm down properly afterwards and borked my knees to the extent that I couldn't go down stairs without excruciating pain! I did the sensible thing and took a couple weeks off the commute so my knees could recover and all appeared to be well. On my first day back in the saddle I managed to slip on a wet cycle path and remove a fair amount of the skin from my left leg. I've since learned that I bent the frame on my new singlespeed which is particularly gutting as I only finished building it (based on a vintage frame) a few days before stacking it. The bigger problem however is the damage that fall did to my ribs. I've just found out that it will likely be at least six months before my ribs are right, which pretty much wipes out pushing myself hard this summer. Having slogged it through a rotten winter the prospect of not being able to make the most of this summer is pretty disappointing I can tell you. So am I downhearted? Am I bothered that I've lost about fifteen Strava KOMs in the last month? Nah, I'm just looking forward to the next ride, no matter now short or long, no matter how fast or slow. You know why? It all comes down to the fact that I like riding bicycles, everything else is just silly details!